Sartorius Stedim Biotech (SSB), a leading supplier for the biopharmaceutical industry, has announced the launch of services for new biological entities, called NBE Product Characterisation. These services are offered by its subsidiary, Sartorius Stedim BioOutsource, an experienced, contract testing organisation based in Glasgow, UK, and in Cambridge, Massachusetts, USA. 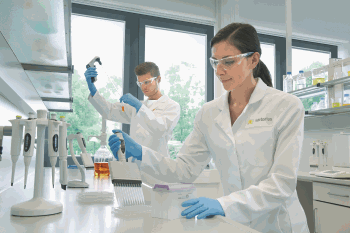 Sartorius Stedim BioOutsource provides a comprehensive range of testing for innovator molecules available either as off-the-shelf assays or custom assay development for more complex proteins. Such tests include cell-based potency assays, bioassays and binding assays, as well as physicochemical and structural analyses, enabling customers to benefit from a fully integrated package. These testing services are fully customisable for clients to ensure their innovator drugs are tested based on the right regulatory requirements by expert scientists. Robust data packages proving the safety, purity and potency as required by the regulatory authorities will smooth the submissions process for approval by the European Medicines Agency (EMA) and the U.S. Food and Drug Administration (FDA). As a result of these fully customisable methods and data packages available for monoclonal antibody characterisation that complement BioOutsource’s and Sartorius Stedim Cellca’s existing innovative offer for biologics, pharmaceutical companies can now work with one contract partner from cell line development to qualification and validation of analytical and biological product characterisation assays. “We are really excited to bring to market this combined package of assay development and customisable off-the-shelf solutions for product characterisation. With our experience in biosimilars testing, combined with our proven expertise in NBE assay development, we have developed a panel of assays suitable for mAb characterisation. This allows drug developers to fast-track complex bioassay development using our platform methods. With fully compliant cGMP facilities, we support our customers from early phase development to late phase and commercial release,” commented Jennifer Lawson, Product Manager for Testing at Sartorius Stedim BioOutsource.